This section contains Manual operated Side-To-Side Tarp Systems, for Grain Carts/Gravity Wagons, Farm Trucks, Grain Trailers & Belt Trailers, Transfer Trailers and more. Generally, there are 2 styles of Side-To-Side roll tarps systems, 1. Strap Type or 2. Kwik-Lock (rolls up under the latch plate for lock down). This tarp is commonly a solid vinyl tarp to keep load dry or a mesh tarp used for sand, gravel etc. or product that does not need to be dry, with a 2” roll pipe pocket on one side and a smaller secure pipe pocket on the other side (sometimes they have an attached front or rear flap attached.). Strap Type tarps have a 2” strap (from 3 to 7 straps, depending on the trailer length) that is looped around the 2” roll pipe through a slit in the pipe pocket that drops down to a ratchet attached to the side of the trailer for securement and has a removable crank handle stored on the side of the bed, used to roll the tarp. Width for a 96” W trailer is usually 9’8” W and a 102” W trailer is usually 10’6” W.
Kwik-Lock roll tarp is commonly a solid vinyl tarp that rolls up under an aluminum Latch Plate or Lock Down rail running down the length of the trailer with a heavy-duty Crank Handle assembly attached to a spline shaft connected to the 2” roll pipe and is secured in crank retainer bracket devices on the sides or end of the trailer. 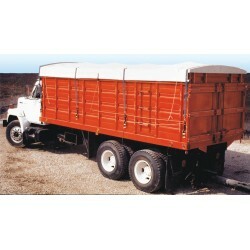 A mesh version of this tarp is also used for Transfer and scrap trailers that do not have to keep the load dry. 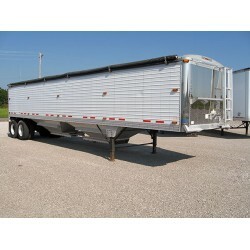 Width for a 96” W trailer is usually 10’ W and a 102” W trailer is usually 10’6” W or 11’ if hauling MIDS. Custom sizes available. Copyright © 2018, ZAMZOW Manufacturing Co, Inc. All Rights Reserved. Site powered by BLAYZER.